Many people agree that free and flowing trade benefits all; however, the citizen living in Olympia benefits the most from commerce, trading, and commercial buildings. Playing the Statue of Zeus in Olympia requires you to pay close attention to the yellow cards. They will allow you to accumulate money and the resources to invade neighbors to secure a high score. Olympia does not require many resources to build its wonder, plus the “B” side’s first level provides an East and West Trading Post. Similar to the Temple of Artemis in Ephesus, you want to pay attention to your neighbors; buying resources for half the price makes your neighbors’ resources more attractive. You should never need to play more than a couple of raw material cards when playing Olympia. You only need to acquire one wood, two stone, and two ore. This set up naturally forces the player to gravitate towards picking commercial structures. Even if your neighbors somehow do not provide the raw materials you need, you can take Caravansary in Age II to help construct your wonder. I would recommend constructing a couple stages of your wonder in Age II, possibly finishing the third level. If playing side “A”, save constructing your final level for Age III. Olympia does not have a significant amount of cards that will score seven or more points in the final age; therefore, a high scoring hate draft play will prove useful. Make sure you either have Caravansary or Glassworks leaving Age II, because otherwise you cannot play Lighthouse. Forum can help solve this problem if you do not take Glassworks, but you will most likely need a Trading Post from Age I to play it. Side “B” should expect to take Glassworks because playing Trading Posts does not make much sense with its first wonder level. To maximize the effect of Lighthouse, prioritize commercial buildings in all the ages. The combination of cards like Marketplace and Trading Posts with Vineyard and Bazaar makes money a potentially high scoring category. By taking all of the commercial structures, Lighthouse will make its way to you in Age III because no one else can benefit from it. Lighthouse can score upwards of eleven points when you factor in the money it provides. Besides Lighthouse, Arena should also score big points. Arena poses another reason why you may want to level before or early on in Age III. Cash is King, but Commerce and Money needs a Queen. With plenty of commercial buildings and money, what should you produce? Armies! Olympia requires wood, stone, and ore to construct its levels. This positions it to play many military structures. Hope you do not sit next to the Colossus of Rhodes or a player hell bent on “battling”, because you want to play the least amount of military structures as possible to win fights. Losing military conflicts will hurt your overall score in more than one category; it affects the value of Strategists Guild, which you should have no problem playing with Olympia (just find access to Loom). Do not go crazy trying to slay your neighbors if they resist. If your neighbors want to keep fighting you, then consider switching to civilian structures. You can play Statue and Town Hall with little trouble. With good timing and access to the right resources you could end up playing Baths, Aqueduct, and maybe even Palace. Do not forget that the second level of side “A” allows you to play a card for free each age, helping you play the difficult civilian or military structures. Do not count on the second level of side “A” to cheat on resources. If it makes sense to take Glassworks, then take it. You do not want to feel stuck saving your level power to cast a future Lighthouse, making you pass Palace now. Keep that power open to allow you to play a devastating guild as well. For example you should never have the resources to play Philosophers Guild. If your neighbors’ take scientific buildings, then you will rejoice that you can play it for free because of your wonder power. Under normal circumstances keep a look out for Glassworks and Loom because it makes it easier to play Lighthouse, Strategists Guild, and Magistrates Guild. What Other Guilds Can Olympia Play? Although Craftmens Guild works well with Olympia’s resource requirements, maximizing its benefits will usually screw up your commercial structures plan. If you take Glassworks and Loom to play cards in Age III, then you hurt your potential score from Craftsmens Guild. If you do not take the manufactured goods, you could run into trouble playing other guilds or Lighthouse. Forum will solve all of these problems, opening up every potentially good guild; however, you will usually need a Trading Post from Age I to play it (two clay has terrible synergy with the rest of Olympia’s set up). If you play side “B” of Olympia, you will not need to take the Trading Posts in Age I. This creates the problem of supporting Craftmens Guild. For one card that may not even make it into the card pool (even with seven players the game excludes one guild from play), do not build your strategy around Craftmens Guild. Positioning yourself to play several guilds and Lighthouse provides a safer probability of receiving the cards you need. Also with side “A” and no Trading Posts you could just use your wonder power to play Craftsmens Guild for free. I compiled a list of cards to seek out in each age. The order of the cards on the list does not reflect their importance or ranking relative to other cards in the same age. I understand that the list includes more cards than picks, but no game plays out in identical fashion. The additional cards attempt to provide more flexibility for this comprehensive list. Note: The above list does not include any civilian buildings you may play due to circumstances of how the game unfolds. Use your best judgment. Play the civilian structures that require the least amount of work to play, and only if you can make time to play them. Also remember the progression of what cards in later ages require in order to bypass their resource cost. If you notice that other players at the table took Caravansary, then prioritize Glassworks in Age II if you do not already have it. If you leave Age II without Caravansary or access to Glass, then you miss out on playing Lighthouse (the most important card in Age III). Does the above picture represent the way you would play Olympia? Comment below and add your opinion to the discussion. If you found a better strategy, then tell us about it. 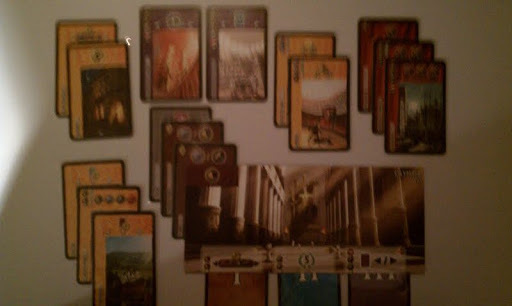 For more information about 7 Wonders check the product page on BoardGameGeek.com. 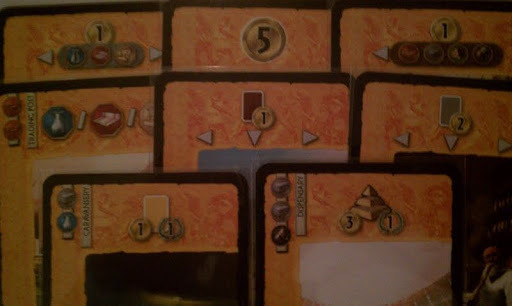 Interested in purchasing a copy of 7 Wonders? Try the following links. If you live in the tri-state area, consider stopping by AU to pick up a copy and play with the staff. Most of them make up my play test group. We play usually every Monday Night. This really has nothing to do with Zeus but rather the commercial buildings. I have found that whenever I go heavy yellows, I do not win the game. With that in mind, I can only theoretically see a game in which I go heavy yellows and win is if the other picks are heavy science. It is because both let you play things for cheap or free.Obviously when you go light resources, you have way less money or comfort for that matter. You start to get into a pattern where your picks go 1.card that gets me money 2.use my money for a building 3.use my money for a building, oops my money is all gone repeat. You begin to waste picks just so you can buy resources to pay for your next few buildings. I can only see this going away if towards the end of the game, you are playing cards for free via science. I agree with your points with commercial structures, but disagree with your comment about Zeus. Zeus starts with papyrus and wants wood, giving the player access to many free scientific structures. Also both sides provide the player with money when constructing the wonder. Zeus naturally forces the player to play in a way that exploits the benefits of commercial structures, because it gives the player money and access to many scientific structures. assuming you won all the military (18 pts) and have 11 yellow cards including lighthouse (11) and arena (3) plus winder (5 for side b) that,s 37 points, which will almost always loose the game. Very true about 37 points losing you the game; however, the big oversight here is the money that the yellow cards provide, since they add up to points at the end of the game. With 11 yellow cards, Lighthouse is really worth essentially 15 points: 11 points from yellow cards, and if you have at least one dollar, four points from coins. I look at Arena the same way. Think of each three bucks as another point at the end of the game. Just these two factors alone push the Olympia player to over forty points. This isn’t counting money you receive from any other source. With Olympia’s Age I ability on side B, you should be able to conserve money and build a lot of cash for a decent amount of points. Personally if I could chose, I would pick to play side A, but this is the strategy I would lean towards going into the game. Of course opening packs and picks and change things. Thanks for the response. I hope you’re enjoying the content. If you want to submit articles for the site, feel free to reach out to us.